Traded to Jets by Quebec Nordiques for Robert Picard, November 27, 1985. Traded to Quebec Nordiques for Gord Donnelly, December 6, 1988. Traded to Jets by St. Louis Blues for future considerations, November 26, 1991. Released by Jets, July 28, 1992. The Jets acquired veteran defenseman Mario Marois from the Quebec Nordiques in exchange for Robert Picard in November 1985 in a controversial trade that was rumored to be made because Marois had a right-handed shot, while Picard was a left-handed shot. Marois, however, was a solid addition to the Jets' defense corps and he remained with the Jets until being dealt back to the Nordiques in December 1988. After two more seasons with the Nordiques, he moved on to the St. Louis Blues and he was re-acquired by the Jets in November 1991. 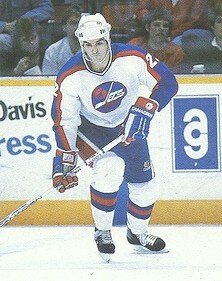 His last NHL action came with the Jets and he retired following the 1992-1993 season. Marois was originally drafted by the New York Rangers and future Jets' General Manager John Ferguson in 1977. In addition to the Rangers, he also played for the Vancouver Canucks before being traded to the Nordiques.